In a recent article in The Journal of Adolescent and Adult Literacy, author Arlene Lundmark Barry describes the walls of an art museum as “vertically displayed, exploded textbooks.” Indeed, most museums are strangely similar to textbooks: there are images accompanied by captions (though some of the images might be three-dimensional artifacts), and longer pieces of text (found on the wall instead of on the page) to help viewers place the art or artifacts into a context. As far as most students are concerned, a trip to a museum is unquestionably preferable to reading an assigned textbook or novel. 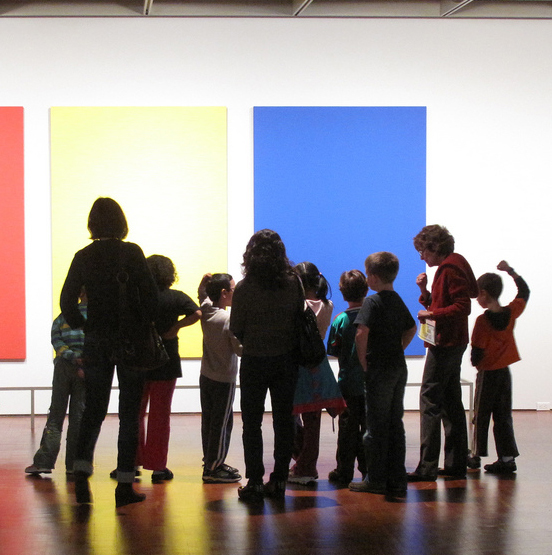 Teachers and families can turn museums into fertile ground for critical thought. Museums are not only fun places to visit, they can inspire students to think deeply across the content areas. Below are some examples of questions to get students’ minds working across a variety of themes and content areas. How did the artist feel about his subject? How can you tell? What do you think has just happened in this painting? What will happen next? What was the artist trying to communicate by exaggerating/downplaying this part of the sculpture? Describe the emotional atmosphere/climate/culture/time period associated with this setting. How can you tell? When/where do you think this was created? Does this artist’s portrayal of (Juliet, the Lady of Shalott, King Arthur, Saint Peter, etc.) match your mental image of him/her? What’s the same/different? Do you like this portrayal? Why or why not? Find a piece of art that reminds you of a theme in a book, story, or poem you’ve read. Imagine you are one of the people in this painting. Write a letter to another person in the painting, or write a diary entry about the event shown . Imagine that the city council has proposed painting a mural of this image on a wall as a statement (of anti-violence, in support of education for all, about the importance of natural conservation, etc.). Do you think this image is a good choice? Write an argumentative essay explaining your opinion. Write a poem/short story that uses words to convey the message the artist wanted to convey visually with this piece of art. This painting shows a doctor treating a patient during the artist’s time. Is this a sound treatment? How does your knowledge of biology and the human body inform your response to this treatment? Explain why so many sculptors chose to use marble/bronze. What are the pros and cons of working with this material? How is fractal geometry used in this image of waves? Can you find other fractals in the museum, or recall any you have seen in the world elsewhere? Explain mathematically why the stone arch in that painting was a better architectural choice than a rectangular opening. Can you think of an even better design? What does this image tell us about transportation during this era? Using what you know about Spain during this period, how might the church and the king have influenced the way the artist painted this picture? List some differences between medieval and Renaissance paintings. How did the different ideologies of these periods shape these different presentations?